Ann Arbor Public Schools will launch an informational campaign for its upcoming technology millage during an event Wednesday at Huron High School. 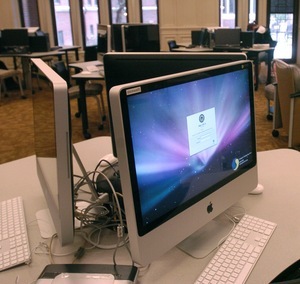 Ann Arbor Public Schools would spend about $25 million to purchase new Mac computers if the district's technology millage passes in May. The kickoff will start at 6:30 p.m. in the cafeteria. District administrators, parent-teacher organizations and union representatives will be present to discuss the bond proposal with the community. Voters in the Ann Arbor district will be asked to consider a $45.8-million bond for technology improvements in the May 8 election. If passed, the proposal would levy an additional .45 mills (or 45 cents per $1,000 of taxable value) from taxpayers beginning in July 2012. According to AAPS, the impact to voters whose homes have a market value of $100,000 would be an additional $26 per year. Voters with a $200,000 to $300,000 home would pay an extra $51 to $77 per year. The technology millage originally was planned for the November 2011 election. However, school officials decided in August to push it back so they had more time to communicate with the public about why the district needs the bond. Voters approved a five-year bond in 2004 with $20 million going toward technology. That money was spent on new computers; assistive classroom technology, such as Smart Boards and sound amplifiers; and career and technical education equipment. The 2012 bond plan would be phased-in over the course of 10 years in three separate series, spending $27.27 million in 2012, $10.57 million in 2015 and $8.01 million in 2018. The first series would be for equipment and infrastructure improvements primarily, while the final two series are not entirely planned out yet, said district spokeswoman Liz Margolis. The most crucial element of the plan is improving the district’s main distribution framework, said Executive Director of Physical Properties Randy Trent. He said an increase in students carrying personal technology devices, such as cell phones and tablets, bombarded the district’s public network, causing frequent crashes. The crashes forced AAPS to turn off the public system during the day, Margolis said. She added the public network acts as overflow for the district’s internal network. “What was happening is the internal system got overloaded, and the public system was being overloaded, so teachers had no way of utilizing the full system,” she said. The district's technology bond plan would increase its bandwidth and infrastructure to support two systems again — allowing the public network to be back up and running during the day, Margolis said. The district would spend about $3.5 million on server room and wiring closet improvements and an additional $3.4 million on improved wireless capabilities, according to documents prepared by school officials. More than half of the $45.8 million, about $25 million, would be spent to replace the district’s computers — both laptops and desktops. The goal is to provide two laptop carts per elementary, three laptop carts per middle school and 12 carts per high school, according to emails and documents obtained by AnnArbor.com. The exception would be at Forsythe Middle School, which would receive four carts because it has less overall computer lab space. Trent said 99 percent of Ann Arbor’s computers are three years old or older. Sixty-six percent are five to six years old and 34 percent are seven to eight years old, he said. Trent explained in tech years, that’s really old. Ann Arbor Superintendent Patricia Green said the aging computers are becoming more and more difficult for teachers and students to use. The technology plan the district has put together would allot about $300,000 for replacing and repairing about 500 printers. Also included would be equipment for career-technical education purposes. So far, $166,000 per series or about $500,000 total has been designated in the plan. Another $500,000 would be set aside for human resources software. While not part of the original bond proposal, document cameras, one per art room, were added to the plan at the request of the district’s instructional team, according to emails. iPads at a total price of $13,500 also would be purchased for the district’s preschool classrooms. This would be in addition to 10 iPad carts for sharing among elementary buildings. The majority of mobile devices the district would purchase has been moved to the second phase of the bond plan, starting in 2015, emails stated. During the first series, all of the district’s classroom projectors would be replaced and mounted. Many of Ann Arbor’s projectors are starting to fail and most display at a low resolution by current standards, said district officials. Also during the first series, about one-third of the district’s sound field amplification equipment would be updated. Trent said this equipment was purchased during the 2004 technology bond. Essentially, teachers wear a small voice amplifier on a string around their necks to help eliminate sound wave interference. Teachers’ voices are then projected more clearly through ceiling-mounted speakers, Trent said, adding the technology first was developed to assist hearing-impaired individuals. But the district found it helps combat poor acoustics and allows all students to hear better, he said. The bond program management and design is estimated to cost $1.2 million, which has been included in the $45.8 million total. AAPS has been working with Barton Malow on the plan. The plan also has a built-in contingency of about $1.9 million and soft costs of an estimated $830,300 for bond issuance, permits and engineers. A briefing book containing information on the technology bond has been made available at the main office of each school building, Margolis said. The public may come in to their child’s school and ask to flip through it, she said. Sun, Mar 4, 2012 : 7:35 p.m. The cost of the technology millage is irresponsibly high. I would rather see Ann Arbor Public Schools go away from the fashionable Apple computers, but instead focus on more economical and practical purchases for students. I believe the 8,142 computers to be replaced should be purchased as parts and assembled by the students (perhaps with the assistance of the local hackerspace, All Hands Active). Instead of OSX, the students would be fine using Fedora or Ubuntu Linux. With as tech savvy as today teenagers are, they should easily grasp desktop linux. AnnArbor.com also reported AAPS was planning on using Google Docs, The students would be much better of using full featured office software like Libre Office or Open Office. For the actual computer purchases, a new integrated motherboard named Rasberry Pi will be released soon for $25 each. Each student could own their own desktop PC for under $100 each. AAPS should look into CentOS for their servers. I can't really think of a good reason why a student would need a school issued iPad when I have an underwater mortgage. AAPS should have someone tech savvy review their plans with the districts interests in mind instead of the hipsters and administrators. Wed, Feb 29, 2012 : 3:26 a.m. Here we go again. Why should the property owners be the ones to foot the bill for this? It is the responsibility of everyone with an income to pay for this. Property taxes leave it to a few people in Ann Arbor to pay for this and many other things. I will urge everyone I know to vote no because I as a property owner am sick and tired of paying for education and everything else while more then half of Ann Arbor is not taxable. Also there are people who will vote on this that do not own property and why shouldn't they they are not paying the bill for this or anything else that property taxes support. NO, NO, NO and NO. No more millages. Tue, Feb 28, 2012 : 11:36 p.m. If the election had been held in November, the school district would have saved ~ $50,000 by not needing a special election. That would have meant the district was a good steward of the district's funds. This may have cost you my and others votes. Tue, Feb 28, 2012 : 9:11 p.m. I do not believe that Liz Margolis truly understands the district's technology infrastructure; particularly the wireless infrastructure. From talking with district technology staff, I understand that the two wireless networks, internal and public, operate on the same wireless access points. As such, they are always sharing bandwidth. Quite honestly, I do not think the schools should be concerning themselves with providing this public wifi. Almost all of our smart phones now have the ability to act as wireless access points for several devices concurrently. In fact, those same smart phones many of us have given our children allow them to access the internet over an unfiltered network connection through our cell providers, effectively bypassing the district's attempts to filter internet access as required under CIPA (Children's Internet Protection Act). Kind of ironic, don't you think? I am also curious about the comment that &quot;The district's technology bond plan would increase its bandwidth...&quot;. As I understand it the entire county is part of a consortium for internet service through Merit. The bandwidth under that agreement is shared among all of the public school districts in Washtenaw county. Is part of the Tech Bond going to purchasing more bandwidth? I suspect that what it will do is expand &quot;backbone&quot; bandwidth. Meaning the bandwidth between the districts facilities. That would still leave the internal and public wifi networks competing for bandwidth out to the internet, which I have been told is all the access that the public wifi offers. So, once again, I do not feel it is good stewardship for the district to provide this public wifi. Instead, focus that bandwidth on instructional purposes. Tue, Feb 28, 2012 : 9:23 p.m.
By the way... This was neither meant as a positive or negative post with regard to the tech bond. Merely observation and critique. I understand that the district's wireless is in need of an overhaul. It is still, reputedly, running at at G levels for bandwidth. I have also been told it does not cover needed areas in most buildings. Wireless has come a long way since the district did their initial implementation under the 2004 Bond, and that infrastructure is sorely in need of an update. Whether or not this is the way to pay for it will be much discussed over the next few months. Tue, Feb 28, 2012 : 6:57 p.m. True in 1998; true now: Computers In Schools by by Lowell Monke - posted Nov 02, 1998 Many believe that the future of education includes a laptop in every child's bookbag. But teachers, parents, and students are paying a price for the emphasis on technology in the classroom. Three years ago an article appeared in the education section of Newsweek magazine under the title: &quot;We Have Seen the Future: It is in Iowa.&quot; I don't know if it surprised anyone else, but it sure shocked a lot of us teachers in Iowa. The article was, of course, about technology: specifically, the Iowa Communication Network (ICN), a fiber optic network the state was building to provide high speed computer communication among all schools in the state. It turns out that the ICN has not been the panacea many thought it would be, and it is rarely spoken of as a model for the future of education in this state, much less the country. But that hasn't stopped us from taking our new role as cutting-edge educators seriously; in fact, the governor's commission on education recently proposed putting a laptop in every student's book bag. Though I am a computer teacher, it is becoming obvious to me that this constant effort to infuse technology into education is more likely to harm than help our children. My argument has two parts. The first part is simple and obvious: Computers make some kinds of learning easier and less painful by externalizing some human skills. We hear some variation of this statement every day, and it is promoted as a great advance in education. The second part of the argument has to do with the fact that there is always a price to be paid when a tool makes a job easier. (read the rest: <a href="http://www.yesmagazine.org/issues/education-for-life/798)" rel='nofollow'>http://www.yesmagazine.org/issues/education-for-life/798)</a> The perceived &quot;need&quot; to spend millions on computers is a total distraction from what ought to constitute genuinely valuable educational goals. Tue, Feb 28, 2012 : 4:06 p.m. I completely agree that AAPS has made many bad financial decisions. However, @local has the right of it - these technology upgrades need to be purchased regardless of whether or not this millage passes. If it fails, the money will come out of the general fund and will impact class sizes, staffing, etc. This money is not being spent on anything fancy, but on providing basic technology equity for all schools. For example, at some schools, they first need to do asbestos abatement so they can run cables through the walls. Some schools already have good projectors and enough laptops, while others do not. Teachers and students use this technology every day, and teachers are currently struggling with things that just don't work. I have seen this firsthand. The district is not looking to buy iPods, or top of the line anything - they just need basic equipment. Please vote &quot;yes&quot; on this millage!! Wed, Feb 29, 2012 : 3:25 a.m.
Beth - Go back to the promises on the sinking fund and the detail provided. Now compare that to what they did. Go back to the Skyline bond fund and the detail provided. Now compare that to what they did. Go back to... pick a millage. Once they have the money, they don't follow the plan, they do as they please. Just like any politician. Remember the promise to close Guantanamo Bay? I put this detailed plan on the same level as that promise. They don't have my trust that they will do what they promise. Tue, Feb 28, 2012 : 8:05 p.m. The district has made very specific plans, listing what is needed at every school in the district. I am a member of the PTOC Council - a group composed of representatives from the PTO of every district school - and these plans were shown at the last meeting. I believe there are supposed to be copies available at each school, and parents or community members can ask to see them. It was really eye-opening for me to hear how great the discrepancies are between schools, and to hear about how this millage covers so many things like the asbestos abatement that I never would have thought of. The district is truly not planning to buy any &quot;fancy&quot; items - if you don't believe that, please do look at these plans for yourself. AnnArbor.com, can some representative examples of what various schools need be mentioned in a future article? I think others might find that helpful, as well. Computers are used every day in the clasrooms, in big and small ways. Children who need extra help with math have access to various online sources for practicing skills. Children look up the day's weather, or practice literacy skills, or type papers, or do a typing tutorial, or look up books at the school library, or do research for a report, or...... Teachers use technology in a variety of ways as well - they use the projectors to project documents they have created or scanned into their laptops, or to show children how to connect to the school server, or to show various online resources, or..... None of this is that high-tech, but it enriches the classroom experience for all children, and it also helps prepare them to be computer-literate adults. Tue, Feb 28, 2012 : 5:50 p.m.
@RUKiddingMe the problem is an oversight issue, not an expense issue. Tue, Feb 28, 2012 : 5:29 p.m.
What do you think are the chances that if a school has good projectors, it WON'T get new ones? The problem is that they don't spend money wisely. And how can you say the money won't be spent on anything fancy? Have you ever been a psrt of a tax-funded rollout like this? I've never seen or heard of one NOT clogged with criminal waste. Tue, Feb 28, 2012 : 2:59 p.m. Does everyone remember the relatively recent story about the &quot;solution&quot; they bought so meeting minutes or Agendas could be shared instead of people making copies? ...And how much it cost? ...And how oddly niche-bound it was? ...And the maintenance cost of it? ...And how there are about 30 cheaper and better (unless there's a whole lot of what it does not being mentioned) solutions to address a very very small, common, and easily addressed problem? ...Ad how even when they were cheerleading how much money it would save because of copying that it was still a loss, even before you get into the unmenioned costs? THAT'S where your millage money's going. Wasteful spending. That's the problem. Here it is: <a href="http://www.annarbor.com/news/ann-arbor-schools-approves-9000-for-electronic-board-documents-software/?plckFindCommentKey=CommentKey:a1974d51-09e2-4d13-93e5-391f7344a1c7">http://www.annarbor.com/news/ann-arbor-schools-approves-9000-for-electronic-board-documents-software/?plckFindCommentKey=CommentKey:a1974d51-09e2-4d13-93e5-391f7344a1c7</a> Please read and take not of things like &quot;...if they decide to get accessories like IPads...,&quot; etc. In business, people often make mistakes and bad purchases. This one, though, would get someone or several people fired in just about everyplace I've worked. That's what happens when you don't have guaranteed revenue and the ability to hold people's concern for their children hostage; you have to make GOOD decisions or get fired. At AAPS, who cares? Raises all around. Tue, Feb 28, 2012 : 2:17 p.m. The article says: &quot;Included in the tech bond plan is: Expanding the wireless infrastructures for greater support and speed Expanding the network video system for the district Replacing 8,142 of the district's approximately 8,250 computers Purchasing mobile technology devices, such as iPads, for student use Replacing the sound amplifiers in classrooms across the district Upgrading server rooms, replacing some servers and fixing heating and cooling issues in these rooms&quot; Aside from purchasing replacement computers, every single item on this list could be done with &quot;sinking fund&quot; money from the existing, ongoing millage or have been funded from the &quot;left over&quot; construction bond money that went to pay for elaborate upgrades to athletic facilities over the past two years. Computers do wear out / get broken / have a finite life. That issue was discussed at some length during the previous technology bond campaign. What the district claimed back then was that the sinking fund would free up enough general fund money to allow for &quot;rolling replacement&quot; of computers on a 3 to 5 year cycle.. The sinking fund is still in place. What's changed? iPads? Smart phones? Fix the infrastructure and network capacity issues with sinking fund dollars, as originally intended. Then let those kids who have the tech bring their own. Buy school-provided mobile technology devices only for students whose families can't stretch their budget sufficiently. Tue, Feb 28, 2012 : 12:57 p.m. I can just see where this is going: We need new mops for the janitors! Quick, another Millage Campaign. We need gas for the lawn mowers! (gas is going up, eh) Quick, another Millage Campaign. &amp;etc. I thought that is what a GENERAL fund was for. For general needs. Like this. Local: Mops wear out too, and gas is used up constantly. So, why do we not have special millages for those? Wed, Feb 29, 2012 : 3:22 a.m.
Local - Can I get the name of your supplier, if fact how about you supply it to AAPS? Commercial quality mops in quantity 20-24 (typically bulk pack) - $15 each. Typical desktop computer $300. So your hundreds is only about 20 in reality. Mop lasts a 3-4 months at most. Computers last 3 to 4 years. While one school only needs a few mops, so the mop budget is not close to the computer budget - for each mop over time the cost is about the same as a computer. So I have to understand sbbuilder's comment. Tue, Feb 28, 2012 : 1:24 p.m.
Because you can buy 100's of mops for the prize of one computer. Really, your reasoning for a special millage on those things is ridiculous. Tue, Feb 28, 2012 : 12:23 p.m.
All of you know voters can piss and moan about this bond and how voters are tired of paying for it when the higher ups in the district keep giving themselves raises. Here is the bottom line: these technology purchases will occur regardless of how the vote goes, period. If the voters vote it down, it is going to come out of the general fund and that money will then have to come from somewhere. Where is that money going to come from? Technology is always being upgraded and the needs for upgrades in the schools is no different from those in your own home. DonBee and Mr. Ranzini, you both can argue about it all you want, but this technology is going to be purchased whether the bond passes or not. Eventually the voters are going to pay, whether in taxes or increased cost for activities within the school district (or loss of programs that many enjoy). And to the two of you, if you think the existing technology is fine, go visit a school and check it out for yourself. Tue, Feb 28, 2012 : 2:02 p.m.
Local - The district had over $12 million in sinking fund and bond money that they could have used in the last 18 months, it was spent for new University/Pro level athletic facilities instead. Tue, Feb 28, 2012 : 12:04 p.m. I would rather the Ann Arbor Public Schools come to the voters with a proposal to fix the major flaws in the educational curriculum *before* buying all the technology gizmos. What is the point of having wonderful teaching technology tools if many of the textbooks AAPS is using are shown by scientific peer reviewed data to not only be &quot;ineffective&quot;, but *damaging* to the development of students? For example some of the math textbooks being used are rated as &quot;ineffective&quot;, even having a negative impact on student performance! Then we wonder why the MEAP scores are so awful? Putting more money into a flawed system will just get more results like these: In Ann Arbor here are the average MEAP score results of all grades in 2011: Math 33% failed, Reading 19% failed, Writing 28% failed, Science 64% failed, Social Studies 46% failed. Should the priorities be on getting the best, proven textbooks and curriculum in front of the students? If you are unsure what works and what doesn't work, the U.S. Department of Education has a wonderful website where they rate textbooks and recognized teaching methods by their effectiveness (or lack of), based on scientific observations of peer reviewed data. It's called &quot;Find What Works&quot;, see <a href="http://ies.ed.gov/ncee/wwc/" rel='nofollow'>http://ies.ed.gov/ncee/wwc/</a> I suggest you check your children's textbooks now and then decide whether you want them to have 1) a new computer or 2) a textbook that is proven to actual work? Tue, Feb 28, 2012 : 5:55 p.m.
@beth: Because I am vocal on school issues, my extensive contacts (some of whom are shy and don't want to be in the public eye) supply me with a great deal of &quot;inside information&quot; from the schools. I also have met with and talked to members of the leadership of the AAPS about my concerns when I thought that could be helpful. I am happy to always learn more and anyone can send me info via email to ranzini@university-bank.com. If I am off-base with any of my information, if it is brought to my attention, I am happy to apologize, correct the record and learn what I don't know. @Stephen - I think it's great that you care so much about the schools. Sometimes, though, there's no substitute for actual experience, e.g. with the MEAP tests, before you can knowledgeably comment about what/how the district is doing. I speak as a current AAPS parent and former teacher here - theory is great, but you need to go into the schools and see what is actually going on. The elementary schools always welcome community volunteers as reading buddies or Science Olympiad coaches - have you ever thought about doing something like this to get into the schools in person? Tue, Feb 28, 2012 : 5:05 p.m.
@Beth: I have three reasons for being vocal on school related issues: 1) I have a three year old son and a seven month old daughter. Growing up I had both excellent and awful public school experiences. I want my children to have the former, not the latter. 2) I am CEO and have my life savings invested in University Bank. As a community bank, University Bank's future prosperity is bound to the prosperity of Ann Arbor. Ann Arbor will not prosper if our public schools are not first rate. 3) As someone committed to social justice, I want to see all children educated by the time they reach adulthood. It is a major social justice issue that 21-23% of our children reach adulthood as functional illiterates. Tue, Feb 28, 2012 : 4:08 p.m.
@Stephen, I'm wondering - do you have school-aged children, or do you work in the schools? You have a lot to say on education issues, and I'm curious to know what your actual experience in the AAPS schools is. You are off topic. Meaps are flawed to begin with. Tue, Feb 28, 2012 : 12:07 p.m.
&quot;actual work&quot; should be &quot;actually work&quot;. My apologies. Tue, Feb 28, 2012 : 11:54 a.m.
Not so fast, Don Bee. Have you not update your computer in the last couple of years? Added a couple of IPADs and cell phones? Are you using electonic devices you bought 4-6 years ago after dozens of people have handled them frequently. Don't just say no because it feels like a good idea to say no. Think it through. I'm still getting over you saying AAPS was the best of the best. Put your money where you mouth is. Stuff wears down and needs to be replaced and updated. Just like in your own house. This is a valid millage request. Tue, Feb 28, 2012 : 5:48 p.m. I agree that dipping into that fund is likely a one time move, unless something extraordinary occurs. Still, it's better than bigger classrooms. The millage will help assuage the cuts, they aren't a miracle, but it will help. Tue, Feb 28, 2012 : 4:36 p.m.
@cette - Dipping into the fund as they are already planning to do is inadvisable. Simply put, with the current level of their fund equity, they will be unable to do so again. Tue, Feb 28, 2012 : 3:23 p.m. I meant kids, not kills. Tue, Feb 28, 2012 : 3:22 p.m.
Those things will have to be replaced or curriculum just adjusted, when the computers wear out, the kills will just share leftover computers with the other kids in the classroom, until what, there aren't any left? What's the big picture folks? AAPS is planning on using their reserve money to keep things going this year, and trying to keep cuts out of the classroom. They aren't going to be able to do dip into this fund for multiple years in a row, it'll put them into financial jeopardy if they do. This millage will give them some breathing room to keep things going. Financial adjustments will continue and reorganization of priorities are happening. Don't just beat up on the district for mistakes, help them do it better. Tue, Feb 28, 2012 : 2 p.m.
No Cette I have not. My budget does not allow it. I also did not waste over $12 million of money that I could have spent to fix these problems on &quot;extras&quot; that were not in the original budget for the other bonds. Tue, Feb 28, 2012 : 12:47 p.m.
Tue, Feb 28, 2012 : 11:53 a.m.
Why is the briefing book not online? Old technology? Tue, Feb 28, 2012 : 11:33 a.m.
With the millions spent on Administration Raises, The new Superintendent's salary, the new Varsity Weight Room, the New Super Deluxe Locker room for varsity athletes and all the other waste that has gone on this year my vote is very simple: NO! I would recommend a similar vote from every other voter in the school district. Until the district actually uses the money they have in a wise manner, vote NO! Of course we will not await the outcome of the new lawsuit, because the administation did not act and the high price lawyer the school district gave a raise to, could not come to a settlement with the family of the student. Yet more funds wasted. Wed, Feb 29, 2012 : 2:06 p.m. Wed, Feb 29, 2012 : 3:16 a.m.
cette - It may be valid to you, but not to me. The waste in the district is unreal. They want $25 million - they mispent $15 million this year alone on Varsity sports facilities. They blew over $700,000 on illegal dependents on the health care program, none of it was reclaimed. The lawsuit will cost them at least $1 million. The various administrative salary gains another $1 million. That is the vast majority of what they want from the millage. If they had done it right, there would be no reason for the millage. But then again, some parents decide that just because their child blew their lunch money in video games, that they will just hand them more money for lunch. After all the child needs to eat right? Not me, sorry. They blew the money they needed to do this. They made promises not to do this when they asked for the sinking fund. The network was supposed to be part of the bond fund for Skyline. Skyline only needed 19 new staff members. The enrollment in AAPS was going to rise by over 1,000 students. Yet another set of excuses coming cette. Do we actually do any good supporting this kind of behavior? Do we really? Wed, Feb 29, 2012 : 2:35 a.m. I realize it's frustrating, and I'm not pleased with somethings, and it's much more than the athletic facilities issue, which was a lot of money that was over the top,actually the lawsuit bothers me much more. I don't think the super's salary increase is that important, honestly, she's actually a pretty good administrator. She's more orderly and much more into accountability than what we've seen. She inherited a pile of &quot;stuff&quot; that she has to try and straighten out and quickly. The lawsuit is just galling to read about, just because they won't go ahead and settle, for crying out loud, instead of dragging special ed kids and their families through the misery of trying to defend the indefensible. The bigger problem is the lack of supervision, and reporting, those are real problems that need to be addressed. How things got this far is the real scandal, not the lawsuit itself. To me, it's a valid millage, and I will support it. I don't support all millages, though I did support the special ed millage also. I don't want to deal with yearly millages, that's not going to fly. I don't like county wide millages, Ann Arbor becomes a donor city, and I'm not interested in that. Tue, Feb 28, 2012 : 6:06 p.m.
Cette - true the salary increase for the new Superintendent was only $65,000, but then there were the increases in the benefits package. Yes the &quot;parity&quot; raises were only 28,000, but they were because she hired a new administrator (without formal permission) for more than they were making, and of course benefits changes have to follow the salary raises. Then there are the long unfilled positions in the administration (left vacant to save money) that have been filled or are being filled. So the total administrative increases (mostly hidden in building administration) will be close to a million dollars. As to the ISD - medicaid money - it covers a total of 3.5 years, so it can't be counted in 1 year and people knew it was there, it was not &quot;found&quot;. As to the use of that money - it would have bought a lot of technology. But it paid for administration instead. The promise of the sinking fund was it would &quot;FREE UP&quot; money for technology from the general fund, I found the mailer from that campaign a couple of days ago. So no new millage would be required for technology. Then there is the wasted money from the sinking fund and the bond fund this year on Varsity sports facilities. Then there is the lawsuit that should have been solved by the high priced &quot;in-house&quot; lawyer. Then there is the news this morning in the other article that the food service program makes money for the school system (contrary to any prior budget document). Then there is... In short cette - until the district gets their house in order, my vote is NO! Tue, Feb 28, 2012 : 3:41 p.m.
Don't throw those raises up there like the increases were in the millions, that is misleading.It was 65k plus28k and the super found 1.4 million sitting around in her first few months at the job waiting to be collected, because she knew about things like that. And BTW, other districts benefitted because they went to go collect their money back from the ISD too. I know you are very ticked off about the money on the athletic facilities. That kind of money was too much, but that's a done deal, and that's not Pat Green's fault. Get over it. Don't say no just to say no. Things do wear out, and this will pay for replacements and help the big picture. Lansing still cut money to schools this year again. The realignment of spending is occurring. Let's not make it any worse.